Our Red Cross swim program is a vital part of the overall camp program. Waterfront Head: Victoria Schmidt (please visit our Meet the Staff page to find out more about Victoria and the Waterfront Supervisors). 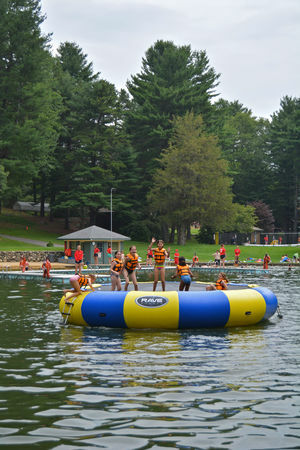 Campers swim twice a day, as there is an instructional swim period in the afternoon and a free swim period in the morning. Our well-trained waterfront staff of over 25 swim instructors, led by three vigilant supervisors, teach children the skills they need to learn to swim and become stronger, more confident swimmers whatever their level. They also oversee the fun at Free Swim. We strive to develop our campers’ swimming proficiency to the best of their abilities. 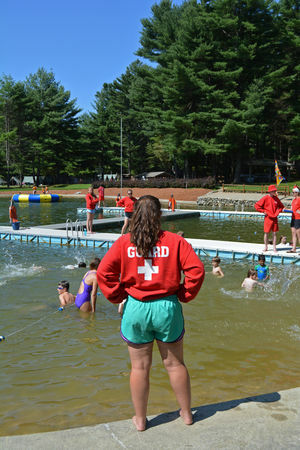 Our waterfront staff is composed of American Red Cross certified Lifeguard and Water Safety Instructors. The majority of our waterfront instructors have obtained both certifications. After camp gets underway, you will receive email notification of your child’s initial swim grouping. A progress report will be emailed to you at the end of your child’s session. In addition, 6 and 8 week campers will receive a progress reports at the half-way point of their session (Sess. 8: July 19, Sess. 6.1: July 12, Sess. 6.2: July 26).